The Washington Wizards have little room for error over the last month of the season if they want any shot of squeaking into the playoffs. That means they needed to take care of business against the lottery bound New York Knicks. It looked like Washington was going to get run out of their own building in the first half when they were unable to hit a jump shot for literally their playoff lives. Thankfully there are two halves in basketball and the Wizards made the most of it by completing their biggest comeback of the season. The Knicks certainly made it easier with 17 turnovers that Washington converted into 29 points on their way to a 99-89 victory. John Wall recorded his 42nd double-double of the season. Kristaps Porzingis and Markieff Morris paced their respective squads at a 4-4 tie in the early goings, before New York went on an 8-0 run forcing a Randy Wittman timeout. The Washington Wizards offense struggled because of an inability to knock down jump shots even when being given space by the knicks. Otto Porter emphasized the struggle with 0 of 5 shooting in the first quarter that saw Washington shoot under 35 percent (8 of 23). On the flip side, the road team was on fire with 54 percent shooting from the field that gave the Knicks a 29-20 lead after one quarter. If a marquee matinee on Christmas Day was set up to be John Wall’s coming out party to America, he certainly lived up to the billing. Wall scored 24 points and handed out 11 assists as the Washington Wizards easily handled the New York Knicks 102-91, upping their record to 20-8 and their all-time Christmas Day record to 15-7. And once the beat-down was secure, Wall stood up to an increased physical presence, as backup forward Quincy Acy tried to intimidate the Wizards point guard by knocking him down with a forearm shiver. Wall responded with a two-hand shove, Acy threw a punch and after the altercation, the Knicks forward was ejected, while Wall has handed a technical foul. Entering the game, Wall was already leading the Eastern Conference guards in all-star voting and can probably expect a boost in the vote totals following the stellar performance. The Wizards raced out to an 11-2 lead and were rarely challenged. Bradley Beal had 17 points and five assists, Kris Humphries had 14 points and Nene added 12 points as the Wizards placed six players in double-figures and outrebounded the woeful Knicks 45-36, including a 13-6 advantage on the offensive glass. Washington also enjoyed a 50-30 lead on points in the paint. Carmelo Anthony paced New York with 34 points, but only two others managed double-digits. The Knicks were 4 of 22 from beyond the arc as a team. The Wizards host Boston on Saturday. 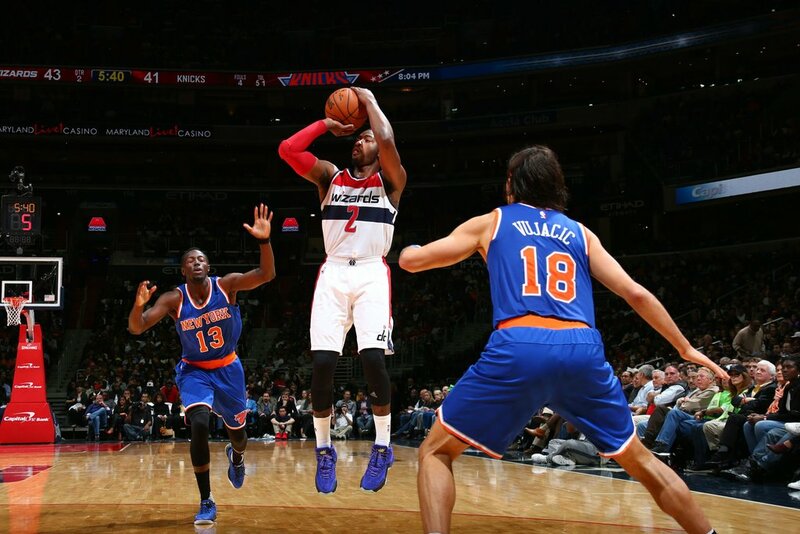 Playing inside Madison Square Garden, the Washington Wizards dropped to 4-4, losing to the New York Knicks, 103-100. With their first playoff berth since 2008 in sight, the Washington Wizards held on to top the Atlanta Hawks 101-97 Saturday night. A Sunday win by the Golden State Warriors over the New York Knicks could seal the deal for the Washington team which continues to insist their focus has been on winning the games at hand. But, the Wiz Kids, without a doubt, will keep their eyes peeled for what happens at Oracle Arena. “I just want to finish the season strong, make sure that we’re going to secure a good spot and then we’re going to think about playoffs,” added center Marcin Gortat. Still, in the here and now, the Wizards will have to figure out how to hold onto games without losing momentum in the final minutes of play. In Saturday’s win, Washington led by 10 points with just 2:38 remaining in the game before the Hawks scored eight straight points to make it 99-97 Wizards. Luckily for Washington, Drew Gooden made two free throws with seven seconds remaining, to bring the Wizards to their 101-97 final. Wall was the star of the game with 25 points and seven rebounds, and Bradley Beal and Trevor Ariza added 14 and 13 points, respectively. Washington also enjoyed a huge advantage off the boards, thanks in part to Gortat’s 11 rebounds. The Wizards recorded 44 rebounds, to just top the Hawks’ 40, but, in the second half, Washington outrebounded Atlanta 26-17. An added element to the game was the fact that the two teams had to overcome slippery conditions, resulting from Saturday afternoon’s Washington Capitals game at the Verizon Center. The matchup between the Caps and Boston Bruins pushed back the Wizards’ start time by an hour, and yet players from both Washington and Atlanta commented that the floor was slippery and could have caused player injury. With two long threes and a follow-up drive to the basket, the Washington Wizards were quickly reminded of what they had missed in Bradley Beal for nine straight contests. In his return to Washington’s starting five, Beal tallied 21 points and seven rebounds, but his final seven points edged the Wiz Kids past the New York Knicks in a gripping 102-101 win Monday night. The victory marked Washington’s first at Madison Square Garden since 2006. The Wizards got off to a solid start. John Wall sank the bulk of his jumpers – even from three-point land, Washington’s defense held the Knicks’ lackluster offense at bay and Martell Webster set the pace for his 30-point night with back-to-back threes to end the first quarter. Four Washington Wizards (18-39) reached double-digit points Friday night against the New York Knicks (35-20), but Carmelo Anthony took matters into his own hands, contributing 30 points and six rebounds to the Knicks’ 96-88 victory at the Verizon Center. It was a record-setting night for Bradley Beal as he set a new career single-game high with 29 points and broke the Wizards’ franchise record for most three-pointers in a season by a rookie. With 25 games left to play this season, Beal will likely shatter the previous record of 75, set by Steve Blake in 2003-04. The Washington Wizards (13-35) fought tooth and nail to slow down Carmelo Anthony and the New York Knicks (31-16) Wednesday night at the Verizon Center, and their efforts paid off with a 106-96 win that snapped New York’s five-game winning streak. Washington may have fell short of slowing Anthony – he posted 31 points and nine rebounds on the night. But, they did their part to counteract him. If you thought Wednesday night’s two-point margin of victory against the Portland Trail Blazers would help the Washington Wizards right their ship, think again. The New York Knicks outran the Wizards and broke through their defense with ease as Washington fell 108-87 at Madison Square Garden Friday night. The loss marked the second time this season the Wizards fell by more than 20 points. To make matters worse, they were handed an extra dose of reality as they watched the Knicks celebrate their tenth consecutive win. For Washington fans who had hoped the Wizards would extend their winning streak to two games, it didn’t take long for the Knicks’ defense to bat them away. At the very least, the Wizards managed to trail the Knicks by a respectable margin for a good portion of the first half. At times, however, Friday’s matchup appeared to consist of all five Wizards on the floor versus Carmelo Anthony – and, unfortunately for Washington fans, Anthony typically won out. He and J.R. Smith each tallied 20 points on the evening, and three other Knicks reached double-figure points by day’s end. Jordan Crawford led the Wizards’ effort with 17 points off the bench as Bradley Beal and Kevin Seraphin added 14 and 13 points respectively, but their combined efforts did little to chip away at the Knicks’ lead. Seraphin at least grabbed 10 boards on the night, but the Wizards never managed a solid run. In fact, the worst anyone looked in a Knicks uniform all night was at halftime – when the cast of Vince Vaughn’s upcoming film “Delivery Man” took the court. During the shoot, the actor donning a Knicks jersey had to shoot free throws, but continuously missed shot after shot. Much to the Wizards’ dismay, however, the real Knicks, sunk two-thirds of their shots at the line, which didn’t help Washington pick up steam in the second half. The Wizards entered the third quarter trailing 57-46, but Anthony managed two driving layups and a three-pointer, and Steve Novak and Rasheed Wallace hit back-to-back three-pointers to help the Knicks to an 86-65 lead to start the fourth quarter. Washington never trailed by fewer than 18 points in the quarter and Smith posted 10 points to help shut down the Wizards, who face no easy task at home as they host the Miami Heat 7:00 p.m.Tuesday night at the Verizon Center. On Friday night, the Washington Wizards suffered their 45th loss of the season as the New York Knicks beat them in embarrassing fashion, 103-65 on the road. The Wizards, who were coming off two consecutive wins against the Charlotte Bobcats and Orlando Magic, ran into a road block up in Madison Square Garden. It was awful. The Wizards never had the lead at any point on Friday night, and by the time first quarter was over, they trailed the Knicks 26-13. It only got worse from there. Washington was seemingly overwhelmed and would not put up a fight at all. While the Knicks were particularly aggressive, the Wizards valiantly tried to keep up; however, New York would take a 54-33 lead at halftime. In the second half, what was already an unfortunate situation in the Big Apple was beyond comprehension. 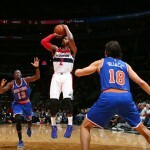 The Knicks would finish the third quarter up, 79-47, as they continued to play solid basketball and went on a 15-0 run that lasted seven minutes; meanwhile, the Wizards only looked more inept as they did not score a point in that time frame before Cartier Martín hit two free three throws with 29 seconds left in the period. They did not even break the 50-point mark until Shelvin Mack’s layup with 6:43 left in the game. Of course, the New York faithful in attendance at Madison Square Garden – as vocal and rough as they can be – let the Wizards have it on the court during the fourth quarter. Before Mack’s score, the Knicks’ fans shouted “forty-seven” over and over. Eventually, the game ended and the Wizards were left to ponder what they endured on Friday night. In the end, the Wizards only shot a ghastly 27.8 percent from the floor. That killed them. New York owned the contest from the start; however, the Wizards made it extremely easy for them. For the Washington, Jordan Crawford had 17 points, while Kevin Seraphin had 12. New York’s J.R. Smith led all scorers with 23 points – all of the bench. Carmelo Anthony scored 18 points in only 29 minutes of play, as he sat out much of the second half. Steve Novak and Baron Davis both had 18 points. Then again, it is probably best if they expunged their trip to New York out of their minds – very quickly. The Wizards will play at home on Saturday night at the Verizon Center against the Cleveland Cavaliers.